Shenzhen Bao'an International Airport (simplified Chinese: 深圳宝安国际机场; traditional Chinese: 深圳寶安國際機場; pinyin: Shēnzhèn Bǎo'ān Guójì Jīchǎng; formerly named Shenzhen Huangtian Airport) (IATA: SZX, ICAO: ZGSZ) is located near Huangtian and Fuyong villages in Bao'an District, Shenzhen, Guangdong, the People's Republic of China. It is 32 km from the city centre (CBD) at Luohu District. It is the hub for Shenzhen Airlines, and a focus city for China Southern Airlines. The airport also serves as a Asian-Pacific cargo hub for UPS Airlines. The airport is currently undergoing major expansion with a new terminal and a second runway under construction. By 2012, it will form one of the three largest airport hubs serving southern China, alongside Hong Kong International Airport and Guangzhou Baiyun International Airport. The airport was opened on 12 October 1991. It occupies an area of 10.8 km². Its runway is 3400 m long and 45 m wide, and it has 53 parking spaces on its apron. The airport also has ferry routes to Hong Kong International Airport, where passengers can transit without going through immigration and custom checks, akin to transit between two flights. Its current terminal covers an area of 152,000 sq meters and consist of 24 jet-ways. Shenzhen airport handled 24,486,406 passengers in 2009, according to Civil Aviation Administration of China, making itself the fifth busiest in China. The airport was also China's 4th busiest and world's 27th busiest airport in terms of cargo traffic, registering 605,469 tonnes of freight. In terms of traffic movements, Shenzhen airport was the 5th busiest airport in China in 2009. 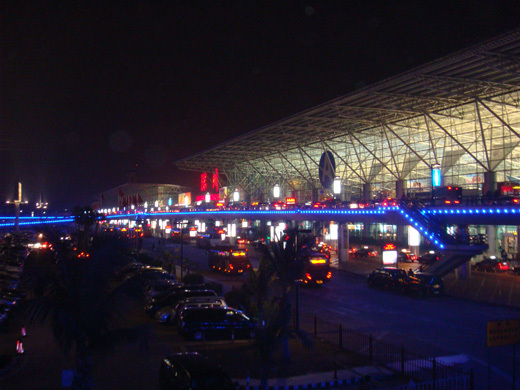 In comparison with Hong Kong International Airport, Shenzhen Airport offers greater connectivity to domestic Chinese cities at a cheaper ticket price but is less convenient for Hong Kong residents and for the international traveler suffers from, on comparative terms, low levels of spoken English. Regular bus and minibus services links the Airport with the rest of the city. Intercity bus services to some other nearby cities such as Hong Kong and Dongguan are also available. Local taxis, and often some taxis from Dongguan, can pick up passengers there. TurboJET also operates fast ferries to Kowloon (Hong Kong), Macau and the Hong Kong International Airport at the nearby Fuyong Pier. Free shuttle buses connect the Pier and the Airport. Buses currently run every half an hour from 7:30am to 5pm at Hong Kong side, and from 10am to 9pm at Shenzhen side. Since beginning of 2008 the 1.6 km long terminal 3 is being built. Architect: Massimiliano Fuksas, Rom; Structure, Facade and Parametric Design: Knippers Helbig, Stuttgart. A second runway running parallel to the west of the current runway will also be built. The new runway will be built on reclamation land extending out towards the Pearl River Delta, with a length of 3600 meters and 60 meters wide. Both the terminal and runway will be finished in 2012.